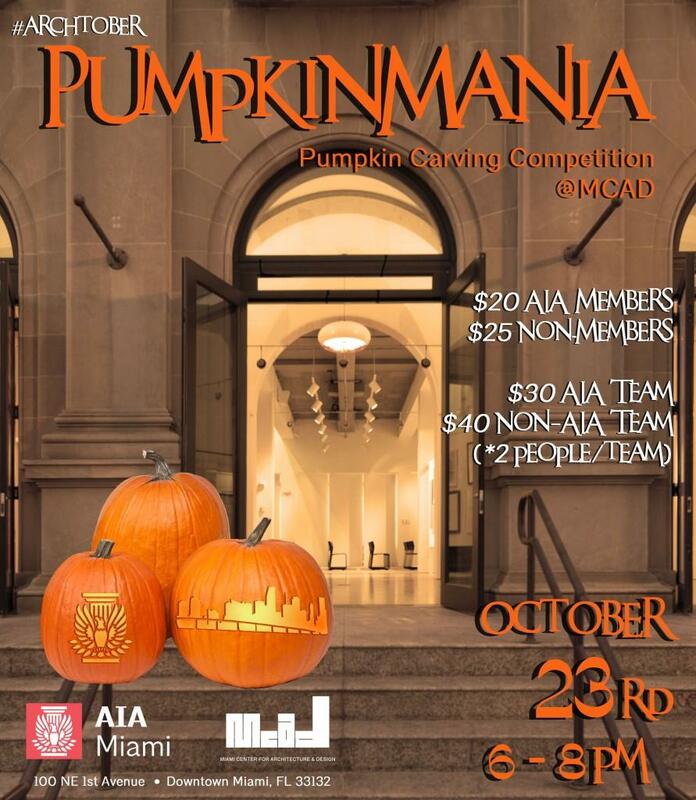 Pumpkin Mania: Architecture Theme Pumpkin Carving Competition | Miami Center for Architecture & Design, Inc. The Miami Center for Architecture and Design (MCAD) and AIA Miami invite you to join us for the 1st Annual PumpkinMania Carving Contest! The event will be a highlight of our month-long celebration of Architecture and Design — otherwise known as #Archtober. With PumpkinMania, we’re combining a favorite fall activity with the opportunity for pros and non-pros to get in on the designing fun! The twist to this event? Participants must carve architectural structures! Architects, designers and enthusiasts alike are all invited to create their masterpieces. Pumpkins, tools, and beer will be provided! Stop by MCAD (100 NE 1st Avenue, Miami) from 6-8 p.m. to join the fun! AIA members can enter for $20 per person or $30 per two-person team; non-AIA member entry is $25 per person or $40 per team.